As YouTube has grown to a major communication platform, there are all kinds of YouTube channels today: from vlogs, beauty, travel, cooking, sports to even farming. With varied topics, YouTube also functions as a platform for people with “differences” to be heard. 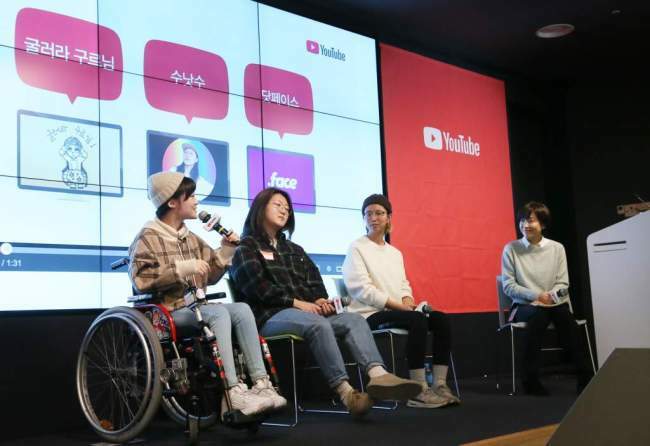 On Tuesday, the video-streaming business invited YouTubers from three channels -- Studio Guru, Soo Not Sue and Dotface -- to a press event at Google Campus Seoul. YouTube categorized them as “diversity YouTubers” who discuss differences. The “Studio Guru” channel is run by a high school student named Kim Ji-woo, who has cerebral palsy. The 19-year-old on a wheelchair shows her daily life through the channel, while casually dealing with her own disability. “Watching TV, I always wondered why there are no celebrities with disability. If a person with disability is on screen, it is usually a really sad movie or sponsorship shows that bring out tears. This is where discrimination comes from,” Kim said. YouTube has created touching moments for Kim. Having a disability that affects her hands, it is difficult for her to upload the subtitles. She asked her viewers to type barrier-free subtitles for hearing-impaired people. Now, all of her videos are subtitled a few hours after they are uploaded. “I wanted to be a YouTuber. I am a person with disability, so I naturally talk about living with disability. That is all,” Kim said. Soo who runs “Soo Not Sue” identifies herself as a queer content creator. She uploads videos that deal with gender identity issues and the LGBTQ community. “Talking with friends, I realized that people hate queer people without a specific reason. So, I started to make videos that tell people what being a queer is about,” Soo said. After some time, she shared with viewers that she is a bisexual. “Making videos, I focus on earning the empathy of queer people. But what is also important is to improve awareness among non-queer people,” Soo said, choosing her “Memorable Coming Out Reaction” clip as her best video. Uploaded in December, the video shows reenactment of people’s reactions to coming out. The clip was viewed more than 500,000 times. “I received messages from queers and non-queers that the clip was a big help for people coming out and on how to react to coming out,” Soo said. Unlike the two individual YouTubers, Dotface (also styled as .face) is a channel with 130,000 subscribers by a nine-person digital media startup. Cho So-dam is the founder of the social-native video outlet. “The idea is to deal with the problems that exist within a three-meter boundary around me. We focus on the people who call out issues that need change,” Cho said, adding that Dotface is about finding identity and values meaningful for the millennials. Dotface uploads videos about human rights, prostitution, abortion and more -- any subject that the young generations may be interested in. The channel received attention for creating a video about parents of LGBTQ children at the 2016 Korean Queer Festival.